Above: This photo taken at the Cat & Fiddle probably dates to the 1910s – around the same time Fredrick found himself in trouble with the law – and shows various forms of transport, including an early car as well as some horse and traps. Another gem from the archives unearthed by Mike. This one from the 7th May 1910 edition of the Buxton Advertiser. And again featuring the Hibbert family of Long Hill Farm (see previous post). Fredk. 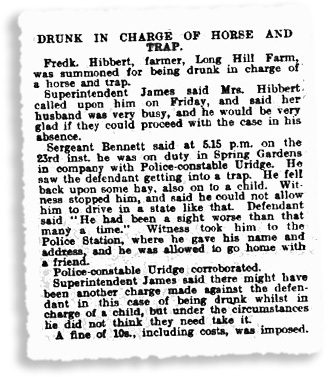 Hibbert, farmer, Long Hill Farm, was summoned for being drunk in charge of a horse and trap. Superintendent James said Mrs. Hibbert called upon him on Friday, and said her husband was very busy, and he would be very glad if they could proceed with the case in his absence. Sergeant Bennett said at 5.15p.m. on the 23rd inst. he was on duty in Spring Gardens in company with Police-constable Uridge. He saw the defendant getting into a trap. He fell back upon some hay, also on to a child. Witness took him to the Police Station, where he was allowed to give his name and address, and he was allowed to go home with a friend. Superindendent James said there might have been another charge made against the defendant in this case of being drunk whilst in charge of a child, but under the circumstances he did not think they need take it. A fine of 10s., including costs, was imposed. Page update 18/3/19: Paul (see comment below) sent me a few more press clippings collected by his wife, who is researching the Hibbert family name. It does seem the family lived on the wild side! In 1884, Burbage School Board served notice on George Hibbert “…for keeping his four children away from school without reasonable cause”. George responded by saying he’d sent them to the Grimshaw’s School the following Monday. 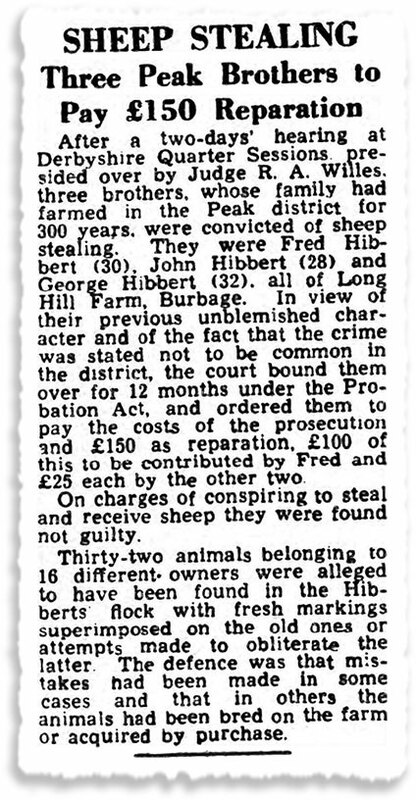 And some 60 years later, in 1943, three Hibbert brothers – John (28), Fred (30) and George (32) – were convicted of sheep stealing: “32 animals belonging to 16 different owners were found in the Hibberts’ flock with fresh markings superimposed on the old ones”. Their defence was that “mistakes had been made in some cases and that in others the animals had been bred on the farm or acquired by purchase”. Fred seems to have been the ring-leader as he was fined twice as much as his two brothers. It can’t have made them very popular in the valley! RESCUING CATTLE FROM THE POUND: John and George Hibbert, farmers, of Fernilee, were charged with rescuing three cows, which were being taken to the pound. A fine of 5s. and costs was imposed. STRAYING COWS: John Hibbert was summoned for permitting three cows to stray on the highway in Manchester Road. Mr. Inspector Lowndes and Constable Casey proved the charge. The defendant, who had frequently to be admonished because of his violent demeanour, was, in consequence of three previous convictions for a like offence, ordered to pay 5s. for each cow, in addition to the costs. The defendant, who denied ownership of the cows, occasioned some amusement by stating his intention to appeal against the decision. Thanks for this and the other recent post involving a Hibbert. My wife is direct descendent of George Hibbert of Goyt head who died in 1837. Seems like I married in to a ruff bunch! Lol! Hi Paul, I also am related to all these naughty Hibberts and would love to be in touch with your wife about the ancestors we have in common. Paul, was George married to Elizabeth Vickers? Regards, Mike.